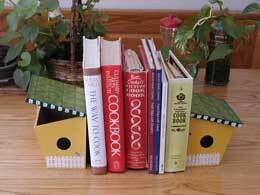 The RunnerDuck Projects page, a place to find all types of projects for your kitchen. We mentioned that we got a new bread maker for Christmas and have been making wonderful fresh bread every week. One thing that we've found to be inconsistent is the thickness and evenness of our slices. This handy little bread slicer guide made that problem go away. 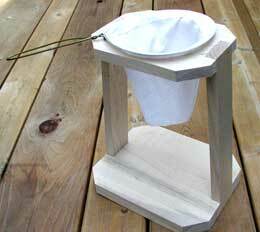 Last week we made the napkin holder for those upcoming outdoor picnics. 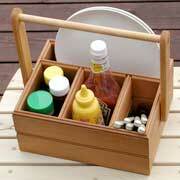 Continuing on with that theme this week we will make a Picnic Caddy. It's a handy caddy to carry all your picnic supplies to the table. How many times have you gotten in trouble because you buttered some toast and left a pile of crumbs behind? 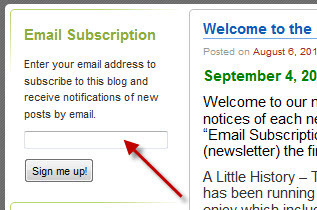 Well this simple project will make that problem go away. 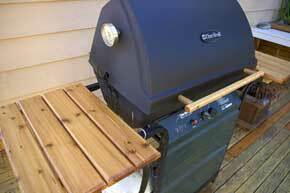 This is a fun and fairly simple project that can easily be built over a weekend. Our camper trailer just doesn't have a good place to mount one of those plastic paper towel holders so I decided to make one for the counter. This is a simple project that requires a little imagination. 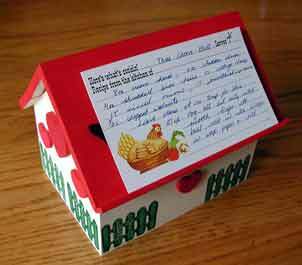 This is a pretty easy project that complements Marilyn's place/recipe card project, April 4th Newsletter. The idea is to make lots of these for gifts when people come for brunch or dinner. 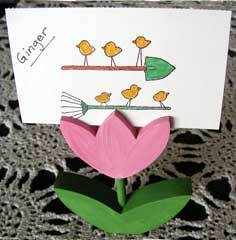 The holder can be used for table place setting and then later for a recipe card holder. 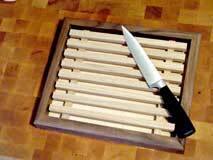 This is a neat little weekend project that makes a nice gift or just a good place to store your own recipes. 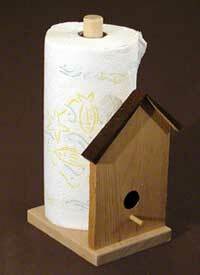 We used Poplar for our project and I'm not sure it was such a good idea. I has a real tendency to warp. If you are going to paint your recipe box then plywood might just be better. Like many of my projects this one was inspired by Marilyn who this time needed a replacement dehydrator for an old electric one she had that died. Her requirements were that it needed to be an air dry dehydrator that would keep the bugs out and would break down flat when not in use. By golly I believe I did it! We have a bar-b-que that works good but looks really bad. 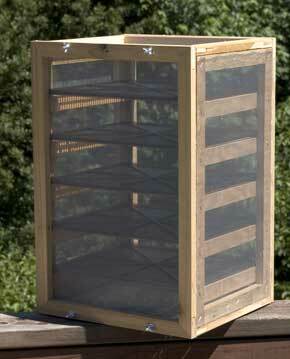 It has wood wings on both sides and a wooden handle across the front. All of them were faded gray and growing moss. It was time to do something but replacing it was not an option. 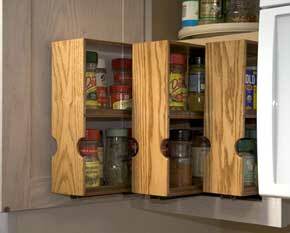 We had always kept our spices on a two tier lazy susan which made getting spice bottles out of the middle difficult. I knew there had to be a better way and went to work. 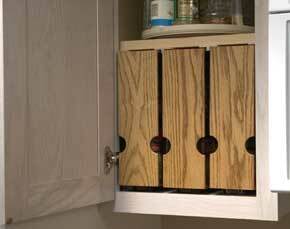 I came up with a three pullout spice rack that has a shelf in the middle giving you two shelves on each pullout. I made the fronts out of oak, the tops, bottoms, shelves and backs out of plywood and edged the shelves with walnut. I think they turned out pretty neat. Our house that we've now lived in for two years had manufactured cabinets installed in the kitchen. They are OK and the shelves in the big cabinets slide out which makes access to things in the back quite easy. 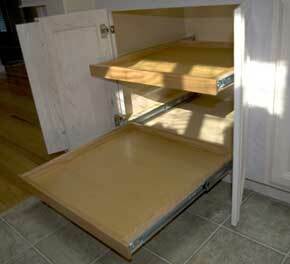 That is to say that all but one cabinet had this feature. The shelves in the cabinet under out built in oven did not slide and they were really hard to get into. I fixed that with some simple shelves and slides.